Okay, I know some version of the phrase “recent developments in rapid and affordable sequencing have made blah blah blah possible…” is something you’ve probably read 10,000 times. However, third-generation sequencing platforms have turned out to be pretty darn astounding. The leaders in this area include Pacific Biosciences (aka PacBio) as well as Oxford Nanopore Technologies (think MinION). 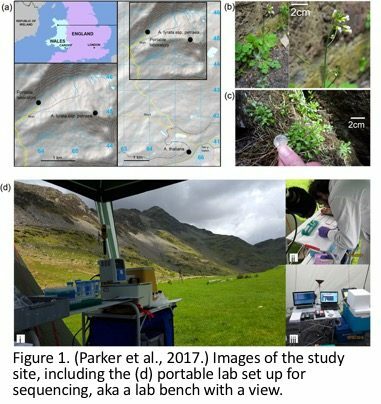 Multiple studies have recently been making the most of the portable technology provided by Oxford Nanopore, and have used the MinION to analyze reptiles in the Ecuadorian Chocó rainforest, Arabidopsis species in the Croesor Valley in Wales, and microbes from the McMurdo Dry Valleys in Antarctica. Although it’s been around since about 2015, the MinION has continued to make improvements, and there have been some cool projects that have demonstrated successful use of this portable sequencer in the field. Just in case you haven’t heard of this tiny device, it is less than 100 grams, literally fits in your hand, and plugs into a laptop via USB cable. That’s it. Seriously. Also, while you have to buy reagents and kits to prep your samples for sequencing, the actual cost of the MinION sitting in your lab is not too much. The study by Parker and colleagues chose a well-known set of closely related plant species. They took what they called their “al fresco” lab to the field to sequence Arabidopsis spp. while in the field. Their goal was to figure out if the MinION was able to tell very closely related species apart. In order to compare the MinION to the popular Illumina MiSeq, they sequenced the same samples on both platforms and mapped the reads to the appropriate reference genomes. Their results found that the Illumina data provided substantially higher coverage (19.5x, 11.9x and 12.0x on Illumina vs. 2.0x, 0.3x and 0.3x on MiSeq, respectively for three different reference genomes). Regardless, they demonstrated that it is possible to collect samples then sequence their genomes over the course of a field expedition. That just sounds so dang exciting when soooo many hours (days…weeks…months…) are usually spent going from collection to sequencing. Parker and colleagues admit that both the quality and yield of sequences using the MinION were lower than with Illumina, they found an average error rate with alignment to the reference genomes ranging from 20.9% to 23.5%. However, as they point out, the MinION reads were quite a bit longer (up to 4 orders of magnitude), and were informative enough to distinguish very closely related species. The authors go on to point out that not only does this affordable, portable system make sequencing more accessible, but it also has some great applications for teaching. “Few technical barriers remain to prevent the adoption of portable RTnS by non-specialists, or even keen amateurs and schoolchildren.” – Parker et al., 2017. 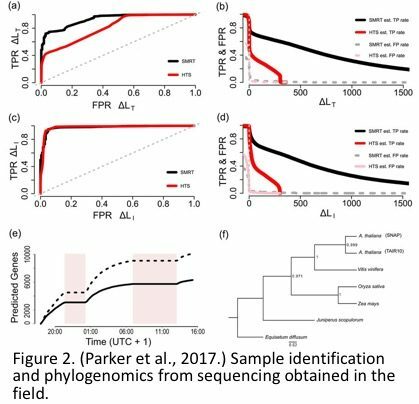 Pomerantz et al., provided another interesting example of how portable sequencing technology could play a key role in identifying organisms in the field. In fact, they took their MinION to Ecuador and demonstrated that they too were able to accurately identify species less than one day after collection. In their study, they identified a toad thought to be extinct for the past 28 years, a rare species of blind snake, and two previously undescribed snake species, highlighting the potential ecology and conservation applications of this platform. The authors point out the utility of a mobile lab, especially in remote regions where transporting specimens might be extremely difficult. This small and relatively affordable platform also makes sequencing technology accessible to labs that previously might wait extended periods of time for their data. This technology provides an unprecedented opportunity in research laboratories, medical laboratories, and even international space station laboratories to bring sequencing to the next frontier. I’m looking forward to seeing what other remote places tiny labs might make travel to. Leggett, R.M. and Clark, M.D., 2017. A world of opportunities with nanopore sequencing. Journal of Experimental Botany, p.erx289. Pomerantz, A., Penafiel, N., Arteaga, A., Bustamante, L., Pichardo, F., Coloma, L.A., Barrio-Amoros, C.L., Salazar-Valenzuela, D. and Prost, S., 2017. 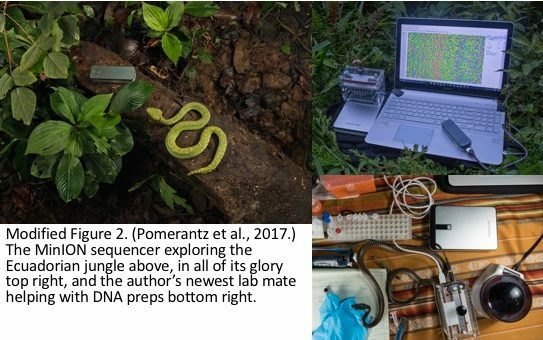 Real-time DNA barcoding in a remote rainforest using nanopore sequencing. bioRxiv, p.189159. This entry was posted in bioinformatics, evolution, fieldwork, genomics, methods, next generation sequencing and tagged genomics, MinION, NGS, third-generation sequencing. Bookmark the permalink.